Nothing is harder than getting a sales prospect to take a chance with your firm the very first time. They want to… but they don’t really know you, or more importantly, trust you. Good news… the solution is right at your fingertips! Nothing can help prospects overcome their trepidation like a “thumbs up” from other similar companies – your existing clients. 1. Put a list of clients on your website, preferably with logos. The fact that you have a long list of clients – in and of itself – is proof that you can deliver on your promises. And if there are notable names on the list, so much the better. Those names & logos should also be used in your capabilities presentation. 3. Ask for referrals. Every once-in-a-while, make sure to ask your good clients if they can recommend anyone else who might benefit from what you do (like they did). This can be in another company… or right down the hall in the same company – perhaps in another division or with another product line. 4. Ask good clients to serve as references. 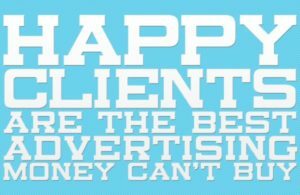 If your clients are happy with your work, they’re generally happy to serve as a reference… just don’t take advantage of their generosity and do it too often. Make sure to get their permission first, before you put them on your list. Also, give them a heads-up before you give out their name, so they know to be expecting the call. 5. Ask for and collect testimonial letters. Got a great relationship with a client… particularly a long-term one? Ask those very good clients to write up something nice about you and put it on their letterhead. These letters should be a mixture of flattering words and specific benefits you deliver. And when a client says they don’t know what to write, tell them that you’ll be glad to write it… and all they’ll have to do is sign it. 6. Gather positive quotes. Are you doing client satisfaction surveys after every project? Assuming you are, make sure you’re asking some open-ended questions… then reviewing the comments when they are returned. If there’s a good quote among the survey results, pull it out and use it on your website… and always cite the source (name & company). 7. Use survey statistics. Related to #6, when you get your client sat surveys back, and assuming you get good feedback, use the resulting numbers in your promotions (e.g. “Last quarter, 96% of all clients were very or completely satisfied with our project work.”). 9. Co-present at a conference. If you and a client have done some really interesting work together, perhaps one way to get a little recognition for it is by co-presenting at a conference – you can talk about methodology, your client can talk about outcomes. Not only does speaking provide exposure and position you as an expert, it comes with the implied endorsement of your client. 10. Co-author an article. Like co-presenting (#9), co-authoring an article about a major project or interesting outcome provides great exposure about your work with a client – but from an informational/educational perspective. In addition to co-authoring, you could interview a client and write an article from that. You could even ask them to be a guest writer on your blog. Bottom line: When you speak about yourself, it’s just selling. But when your clients are part of the message – or even helping to deliver it – you’re no longer selling, you’re providing proof that you can deliver on your promises.